One of the key benefits to be gained from unified communications (UC) is the ability to extend enhanced communications capabilities to mobile users. Unfortunately, mobile unified communications (UC) sits at the convergence of two complex topics: mobility and unified communications. 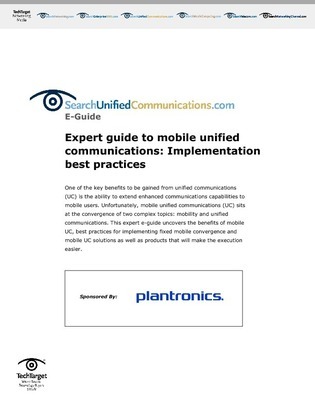 This expert e-guide uncovers the benefits of mobile UC, best practices for implementing fixed mobile convergence and mobile UC solutions as well as products that will make the execution easier.